- The rich, silky body chocolates have been created to brush on and lick off. 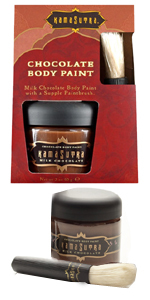 Kama Sutra Single Milk Chocolate Body Paint KS10097 - Brush this rich chocolate body paint onto someone you love, then treat yourselves to a sweet feast for the senses. Glass jar with twist off lid holds 2 oz. of milk chocolate body paint. Packaging includes a supple body brush to create teasing and delightful designs on your lover. Great for a romantic couples getaway or to use at home! This is the perfect way to sample several blends, each is infused with natural essential oils, skin-smoothing emollients and nourishing Vitamin E.